The TROX Academy reopened its doors last month and welcomed representatives from across the industry for two one day events. The theme for this year's Academy sessions is “Air Management Systems and Technologies – Their Impact on Energy Efficiency" which provided an opportunity for TROX Technical Managers to share their insights on how ErP affects AHU compliance, fancoil, air volume management, and chilled beam design. 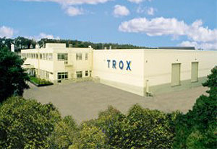 This was not only a presentation based event as delegates also enjoyed a range of practical demonstrations at TROX's laboratory complex and a tour of the manufacturing facilities. Mike Gosling, Product Technical Manager, who led the event said “TROX UK's Academy days have always been very popular due to their strong technical focus and inclusion of technology demonstrations. There has been an increasing demand for this type of event and I am delighted to reintroduce the TROX Academy". Further TROX Academy sessions are planned for later in the year (5th and 6th October) but due to the demand it is expected that additional dates will be offered.